A Bardstown resident, Mrs. Lucille C. Hutcherson, age 92, passed away Tuesday, November 20, 2018 at her residence. 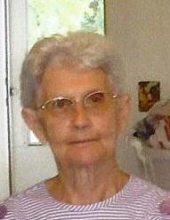 She was born on April 5, 1926 in Meade County to the late Chester and Sweet McCubbins Cundiff. Lucille retired from General Electric and was a member of Nelson County Baptist Church. Besides her parents she was preceded in death by her husband Stanley Hutcherson. Lucille is survived by several nieces, nephew and friends. Funeral services for Mrs. Lucille Hutcherson will be 10:00am, Saturday, November 24, 2018 at the Houghlin-Greenwell Funeral Home with Brother Darrell Goodlett officiating. Interment will be in Highview Cemetery. Visitation will be Friday from 4:00-8:00pm at the Houghlin-Greenwell Funeral Home, 1475 New Shepherdsville Road, who is in charge of arrangements. To send flowers or a remembrance gift to the family of Lucille Hutcherson, please visit our Tribute Store. "Email Address" would like to share the life celebration of Lucille Hutcherson. Click on the "link" to go to share a favorite memory or leave a condolence message for the family.